Lobbying, persuasion, or interest representation is the act of attempting to influence the actions, policies, or decisions of officials in their daily life, most often legislators or members of regulatory agencies. Lobbying is done by many types of people, associations and organized groups, including individuals in the private sector, corporations, fellow legislators or government officials, or advocacy groups. Lobbyists may be among a legislator's constituencies, meaning a voter or bloc of voters within their electoral district; they may engage in lobbying as a business. Professional lobbyists are people whose business is trying to influence legislation, regulation, or other government decisions, actions, or policies on behalf of a group or individual who hires them. Individuals and nonprofit organizations can also lobby as an act of volunteering or as a small part of their normal job. Governments often define and regulate organized group lobbying that has become influential. Xbox is a video gaming brand created and owned by Microsoft of the United States. It represents a series of video game consoles developed by Microsoft, with three consoles released in the sixth, seventh, and eighth generations, respectively. The brand also represents applications (games), streaming services, an online service by the name of Xbox Live, and the development arm by the name of Xbox Game Studios. The brand was first introduced in the United States in November 2001, with the launch of the original Xbox console. The Nintendo GameCube is a home video game console released by Nintendo in Japan and North America in 2001 and Europe and Australia in 2002. The sixth generation console is the successor to the Nintendo 64, designed to compete with Sony's PlayStation 2 and Microsoft's Xbox. The Dutch Top 40 is a weekly music chart compiled by Stichting Nederlandse Top 40. It started as a radio program titled "Veronica Top 40", on the offshore station Radio Veronica in 1965. It remained "The Veronica Top 40" until 1974, when the station was forced to stop broadcasting. Joost den Draaijer was the initiator of the top 40 in the Netherlands. MegaCharts, since 2008 called GfK Dutch Charts, is a chart company responsible for the composition and exploitation of a broad collection of official charts in the Netherlands, of which the Single Top 100 and the Album Top 100 are the most known ones. Dutch Charts are also part of GfK Benelux Marketing Services. Not That Kind is the debut studio album by American singer Anastacia. It was released on June 16, 2000, by Epic Records and Daylight Records. The album features production by Sam Watters, Louis Biancaniello, Ric Wake, Evan Rogers, Carl Sturken, Rickey Minor, and The Shadowmen. Greatest Hits is the second compilation album by the Red Hot Chili Peppers. It was released on November 18, 2003 by Warner Bros. Records. 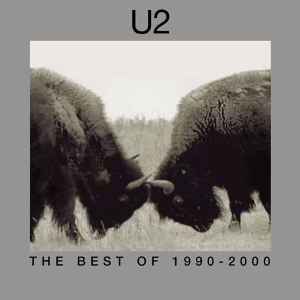 Aside from their cover of "Higher Ground", all songs on the compilation are from their tenure on Warner Bros. Records from 1991 to 2002, in addition to two newly recorded songs. The Greatest Hits is the second European compilation album by American singer-actress Cher, released on November 30, 1999 by Warner Music U.K.'s WEA label. The album was very successful worldwide, topping the charts in Austria, Germany, and Denmark. It peaked at #7 on the official UK Albums Chart, and reached the top ten in several countries across Europe and the rest of the world. This compilation was not available in the United States, due to the release of the US-only compilation, If I Could Turn Back Time: Cher's Greatest Hits which was released that same year. The album sold 3 million copies as of January 2000. The discography of Mylène Farmer, a French pop singer-songwriter consists of eleven studio albums, four compilation albums two of which are remixes ones, six live albums, sixty-five singles and seventeen home videos. Her debut album, Cendres de lune, was released in April 1986 and contained her first hit single, "Libertine". The album was re-released in 1987 with "Tristana", another top ten single in France. On the French Albums Chart, Cendres de lune debuted in 1989, after the success of Farmer's second album, and peaked at number 39 in June 1989. In April 1988, Farmer released her second album, Ainsi soit je.... Thanks to her first number-one single in France, "Pourvu qu'elles soient douces", the album topped the chart as well for two weeks in December 1988. It also contained three more hits: "Sans contrefaçon", "Ainsi soit je..." and "Sans logique". The album was certified Diamond in France and has sold 1.5 million copies there. It was followed by Farmer's first live album, En concert, which was released in December 1989 and became her second top ten album in France, reaching number nine in February 1990. Farmer's third studio album, L'autre..., was released in April 1991, led by her best-selling single, "Désenchantée", which topped the French Singles Chart for nine weeks and also charted in several other countries. The album spawned three more top ten hits: "Regrets", "Je t'aime mélancolie", and "Beyond My Control". With twenty weeks atop of the French chart, Diamond certification and 1.8 million copies sold, L'autre... became Farmer's most successful album to date. The discography of Swedish pop group A-Teens includes four studio albums, one extended play, two compilation albums and thirteen singles. This is a discography of the Dutch electronic DJ and producer Tiësto. Throughout his career, Tiësto has released five studio albums. After spending years searching for his personal style and working with DJs like Ferry Corsten, Benno de Goeij and Armin van Buuren, he decided it was time to focus on his solo work. Tiësto's fame started to rise in the late 1990s after his set at the first ID&T Innercity party, and it continued to skyrocket in the early 2000s following his six-hour "Tiësto Solo" sets, which he performed without any other DJs or opening acts. His last three full-length releases broke the 70,000-unit mark, and the 2003 DJ mix Nyana hit 87,000, according to Nielsen SoundScan in mid-2008. 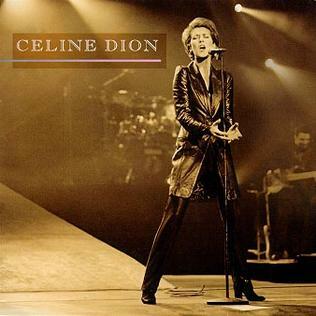 Live à Paris is the third live album by Canadian singer Celine Dion, released on 21 October 1996 by Columbia Records. It features primarily French-language songs, mainly from D'eux (1995), but also includes "The Power of Love", "River Deep, Mountain High" and a studio version of "To Love You More" as a bonus track. Live à Paris topped the charts in France, Belgium, Switzerland and Quebec, and was certified 2× Platinum by the International Federation of the Phonographic Industry, denoting sales of over two million copies in Europe. The discography of Irish boy band Boyzone contains six studio albums, nine compilation albums, one singles box set, twenty eight singles and ten video albums. The discography of Aqua, a Danish-Norwegian dance-pop group, contains three studio albums, two compilation albums, three remix albums and 22 singles. Dutch symphonic metal band Within Temptation has released seven studio albums, three live albums, four extended plays and 20 singles. Stromae, a Belgian singer and songwriter has two studio albums, one extended play, 19 singles and five promotional singles. 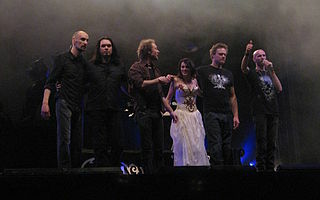 Dutch symphonic metal/rock band Within Temptation has released four video albums and has appeared in twenty-nine music videos and three short films. From their first EP, The Dance (1998), they released an animated music video for the song "The Dance". 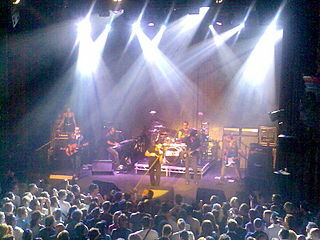 The first live action video came after the release of their second album, Mother Earth (2000), for their national hit single Ice Queen (2001). The single generated two videos, the second one coming only two years later, in order to give the song a better worked music video due to the single newfound international rotation. The second version was directed by frequent heavy metal video director Patric Ullaeus, who had already worked with the band for their Mother Earth video. 1 2 3 "NVPI: English Information". NVPI. Retrieved 2013-12-30. ↑ "Dutch Certification-award-levels" (Word) (in Dutch). NVPI. 1 2 3 4 "NVPI Reglement: Goud/Platina reglement (June 1, 2009)" (in Dutch). NVPI. Archived from the original on 2013-09-29. 1 2 "NVPI Reglement: Goud/Platina reglement (July 1, 2014)" (in Dutch). NVPI. Archived from the original on 2014-12-31. Retrieved 2014-11-28. ↑ "NVPI Reglement: Goud/Platina reglement (April 1, 2016)" (in Dutch). NVPI. Archived from the original on 2016-06-23. Retrieved 2018-06-30. ↑ "NVPI Reglement: Goud/Platina reglement (January 1, 2018)" (PDF) (in Dutch). NVPI. Retrieved 2018-03-14. ↑ "NVPI Reglement: Goud/Platina reglement (October 1, 2015)" (in Dutch). NVPI. Archived from the original on February 22, 2016. Retrieved 2016-07-21.